Find Scruncheon and Touton 2 is the sequel to the highly successful picture book Find Scruncheon and Touton. Young readers will once again enjoy finding the lovable Newfoundland Dog and Labrador Retriever as the two canine pals encounter new adventures in Newfoundland's most recognizable places. 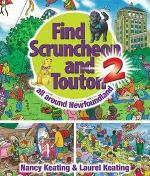 Find Scruncheon and Touton is "a cross between Where's Waldo, the I Spy books, and Richard Scarry's Busytown books," says Canadian Materials. Their reviewer, Alison Mews (a recently retired librarian), describes the book as "bright and engaging." A mother and daughter team, Nancy and Laurel Keating are both award-winning illustrators. They live in Portugal Cove, Newfoundland.